Anonymous The other two folks in my household, neither of whom could play chess before, one because of age, the other because of age(?! ), now play this version daily, without trouble, and after only a few games of practice. It isn't "chess" but it builds enough understanding that they will play without the cards very soon. Anonymous My four year old and I are having a great time learning to play chess thanks to this system. It's great, easy, fast, (something you don't think of when thinking of chess) and still fun. I highly recommend it to parents and kids as a perfect activity together. MileyMutt Great game because it helps to teach chess in an easy to understand way, but can also be played normally. So it's great for beginners and then when they learn they can just play it as a standard chess game. Great quality. 8 yr old can play with no problem. Anonymous Great game because it helps to teach chess in an easy to understand way, but can also be played normally. So it's great for beginners and then when they learn they can just play it as a standard chess game. 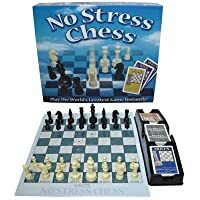 Anonymous This is a great to resource to teach my daughter and wife how to play chess. There are different ways to use this resource. Beginners can learn how to play and advance in skill with this great game! murphy252 I gave this to my grandson for his 7th birthday. Now he and his father play chess all the time. 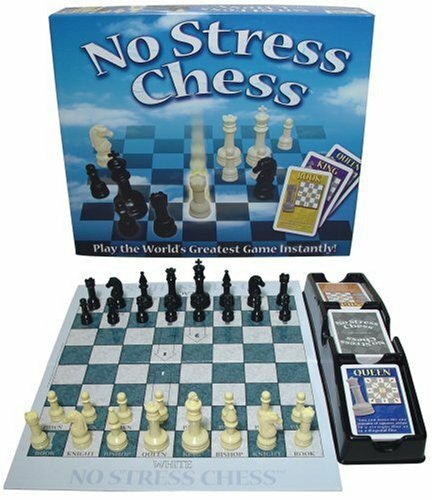 The No Stress Chess Game exceeded my expectations. It makes chess simple to learn. piggybank it didnt make it easier. We'll keep trying.